1. Put all ingredients into the Hot Pot's metal bowl. 2. Set up Hot Pot reflector outside. 3. Put metal bowl into glass bowl and cover. 4. Place glass bowl on reflector. 5. 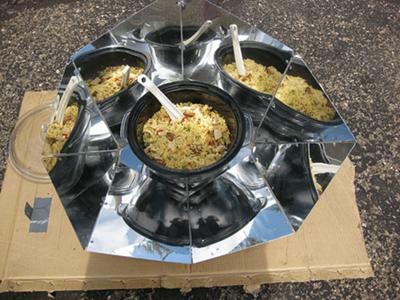 Adjust reflector alignment every 1/2 hour until done - when rice has absorbed chicken broth. It was a rare, partly cloudy day in Tucson today. I set out the paella at 10 AM and cooked it until 2 PM, checking it every 1/2 hour. On a fully sunny day, this probably would have cooked in about 2 hours. It is fully cooked, with plump, tender rice. 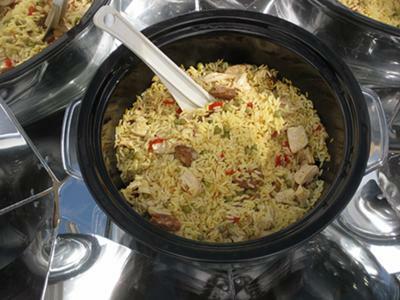 The flavors of the saffron, pepper, and sausage infuse the rice, and the saffron gives it a nice color. My Hot Pot sits on a cardboard tracker (manual), that quickly allows me to align to the sun's position. I usually cook in my driveway.